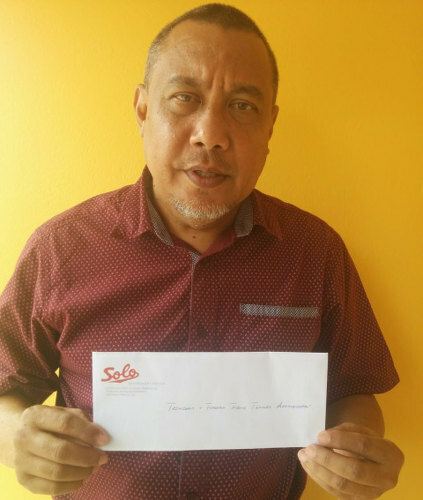 The Trinidad and Tobago Table Tennis Association (TTTTA) has put itself on a collision course with the Trinidad and Tobago Olympic Committee (TTOC), after defying a ruling by the TTOC’s arbitration panel regarding its team for next week’s Central American and Caribbean (CAC) Games in Barranquilla, Colombia. 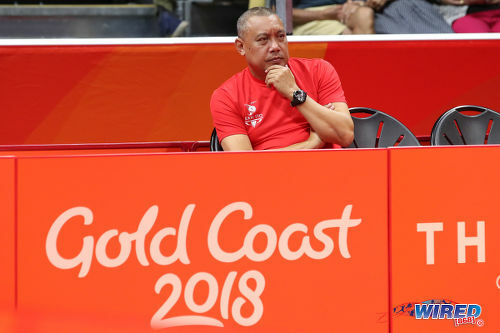 Photo: TTTTA president Ian Joseph watches his charges in action during the 2018 Commonwealth Games at the Gold Coast, Australia. And the panel, which also includes attorneys Stefan Fabien and Christophe Brathwaite, ordered the TTTTA to create a new selection committee to decide on its four male CAC team members. These players were to be informed of their selection by 4pm today, while the arbitration panel vowed to share the grounds for its decision by midnight. 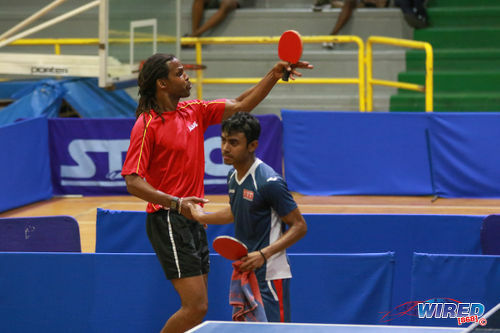 The table tennis body initially put forward a four-member team of Curtis Humphreys, Aaron Wilson, Yuvraaj Dookram and Arun Roopnarine. 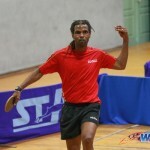 However, the TTTTA’s selection process was successfully challenged by iconic France-based player Dexter St Louis. St Louis was represented in arbitration by Canada-based sport attorney Dr Emir Crowne and local attorneys Matthew Gayle and Sheriza Khan while TTTA president Ian Joseph, executive member Merle Baggoo and public relations officer Sherdon Pierre represented the local table tennis body. Joseph chairs the TTTTA’s selection committee while Baggoo and Pierre are committee members along with general secretary Aleena Edwards and Dave Williams. 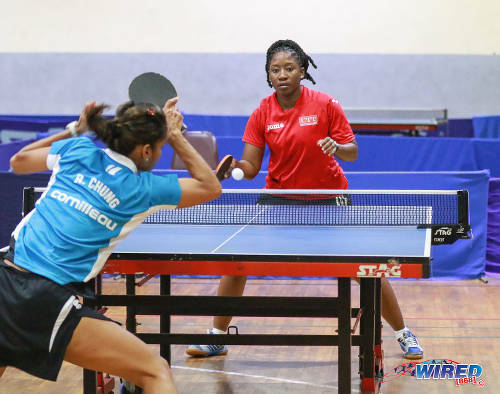 The CAC Games’ registration deadline passed on 20 June 2018 and Trinidad and Tobago’s top table tennis players must wait to discover if the relevant international body accepts TTOC president Brian Lewis’ plea for a late team change. 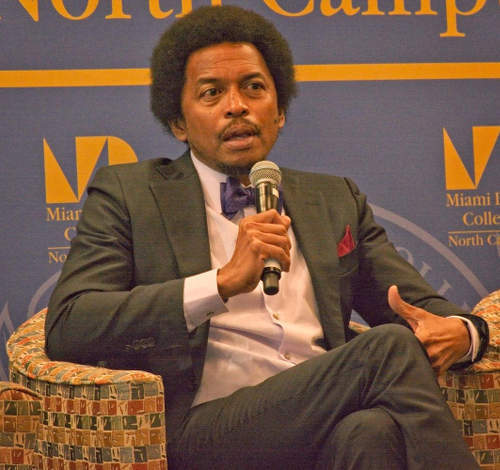 However, Joseph refused to follow the directions of the TTOC’s arbitration panel today and countered that the TTTTA officials were confused by the ruling and did not receive explicit directions on creating a new selection committee. That decision advised is going against the TTTTA’s constitution of a national team Selection Criteria. What was flawed—the decision not to include Dexter St Louis or the Selection criteria used? How come it was flawed for the men and not the women which we did the same process [for], hence that team should [also] be re-selected? The TTTTA’s current predicament is its second high profile legal defeat this year. In both instances, St Louis was—figuratively at least—on the other side of the court room. 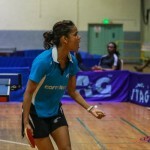 The High Court ruled in February that the table tennis body had unfairly left St Louis and his step-daughter Rheann Chung out of its 2018 Commonwealth Games team. The decision was upheld by the Appeal Court in March. It did not take long for the star players and administrators to be at loggerheads again. Neither St Louis and Chung were invited to play in a CAC qualifying tournament in February, which subsequently appeared to be used as a factor in determining the players selected for the Colombia tournament. Photo: Trinidad and Tobago table tennis star Rheann Chung prepares for her next serve during the 2016 Solo National Championships in Saith Park, Chaguanas. The TTTTA’s own policy regarding its selection of four male players and four female players for the upcoming tournament has changed over time. At one point, the association suggested—as evidenced in an email trail—that the three male players who competed in the February qualifiers would have automatic spots at the CAC Games with St Louis and Aaron Wilson playing for the sole available spot. However, other correspondence from the association also suggested that all four berths were up for grabs and would be decided by a trials. St Louis and Chung argued that they were not given sufficient notice to attend the makeshift trials while another invited player, Khalil Asgarali, was unavailable. The TTTTA then ruled out St Louis—since he did not confirm his attendance for the trials—while Chung was drafted in after Edwards indicated that she would travel to Colombia as a coach rather than a player. The TTOC arbitration panel ruled that the selection process was flawed and should be redone. There was further confusion regarding Wilson’s participation. 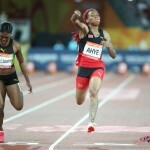 The talented 20 year old, who was Trinidad and Tobago’s best performer at the Commonwealth Games, did not attend the Cuba qualifying tournament. 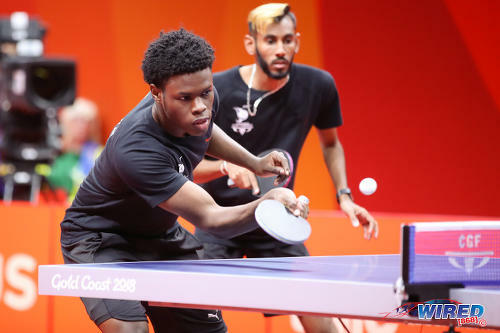 Photo: Aaron Wilson (left) and Yuvraaj Dookram compete in the table tennis doubles competition at the 2018 Commonwealth Games. 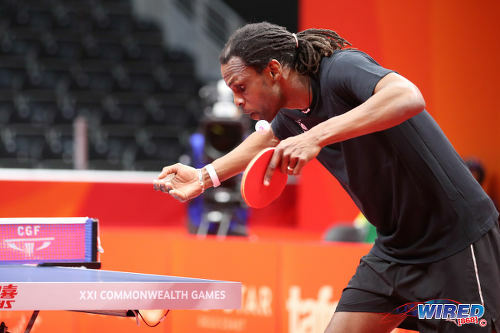 A table tennis official suggested that Wilson, who is the number one locally ranked player at present, could not raise the money to travel to Cuba. Joseph, according to St Louis and his attorney, Gayle, also told the arbitration panel that “economic factors” led to Wilson’s absence from the qualifiers. Lewis told Wired868 that he does have a view on whether team selection should be influenced by the players’ ability to raise money. 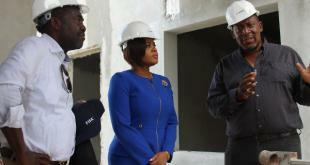 But, on legal advise, the TTOC president did not share that view, so as to avoid prejudicing the ongoing legal matter. The TTTTA, in its press release, suggested that St Louis “self-funded” for Anthony Corbin and himself to compete at the 2017 World Table Tennis Championships in Düsseldorf, Germany—in what was presumably a retort to the player. The local body further suggested that it turned down several offers by local players to pay their way to represent the country. Despite the TTOC arbitration panel’s ruling, the TTTTA suggested that it will stand by its initial decision until further clarification is provided. Joseph is due to travel to Colombia as team manager. He also travelled to Australia, earlier this year, to fulfil the same role. Due to the economic crisis and the absence of subvention since 2016 there has been a struggle for our teams to attend tournaments. However, teams especially juniors are selected earlier than usual to give parents and guardians more time to gather funding. The Association does sponsorship letters and the parents organise several fundraisers throughout the year. All teams selected are self-funded sadly, and the economic status of players is not an advantage or disadvantage in selecting a team. The best possible team has always been selected then the next step is the uphill task of attaining sponsorship. Within the last year, there were a few occasions where players who had finances were rejected spots on the national team because of not being our top players. The three male players and four female players that represented us in Cuba at the CAC Qualifiers in February have been the composition of our national team for the last few years. They were selected from a trial held a few weeks before the team departed. It was not a case of “picking whoever has finances” similar to when Dexter St Louis self-funded himself also registering his friend Anthony Corbin to play in 2017 World Table Tennis Championships held in Düsseldorf, Germany last May. Corbin hasn’t played locally for years and is no way close to the caliber of our national team. Photo: Iconic table tennis player Dexter St Louis (left) acknowledges the vanquished Arun Roopnarine during the 2016 Solo National Championships in Saith Park, Chaguanas. It was decided by the selection committee at that point in time that our top local players would have qualified us in Cuba and didn’t see it necessary for our foreign based players to come. There were only eight women teams registered which meant an automatic selection once we arrived in Cuba. Whereas, the men’s team was ranked 11th with teams we can beat ranked in front of us. The both teams did their job by qualifying for the CAC Games 2018 in Barranquilla, Colombia. After getting the information about the amount of spot allocated to us by TTOC for the games we had two meetings with them and they suggested we should host an open trials. This seemed to be a logical decision because we have not had the luxury to see the foreign players compete, for at least two years, against our improving young rest of the squad who plays nationally. Male Invitations were sent to Aaron Wilson, Yuvraaj Dookram, Curtis Humphreys, Arun Roppnarine, Khaleel Asgarali and Dexter St Louis (the latter two are foreign-based professional players). The women were: Brittany Joseph, Catherine Spicer, Aleena Edwards, Linda Partap-Boodhan and Rheann Chung (foreign based professional player). Photo: TTTTA general secretary Aleena Edwards (right) prepares to face a Rheann Chung shot during the 2016 Solo National Championships at the Central Regional Indoor Sports Arena in Saith Park, Chaguanas. All local players indicated their availability before the stipulated time. Therefore, it was decided that the four men who were available for the trials were selected also the four women. Aleena Edwards became unavailable as a player which opened up the spot for Rheann Chung. Note: 1) The Trinidad & Tobago Table Tennis Association (TTTTA) does not have a website since 2016. 2) Nowhere in our selection policy states that players must be informed three months in advance. What was flawed, the decision not to include Dexter St. Louis or the Selection criteria used? How come it was flawed for the men and not the women which we did the same process, hence that team should be re-selected? How are we selecting the committee to select the players and how are they providing their decision to the panel? As of 2pm on Tuesday afternoon, there was no reply from the panel making it difficult to proceed further. Next Dear Editor: Did Police act lawfully to find Imbert’s phone? And what about other victims of crime? If he is fit,able,and can still play well let him be part of the team I am sure he can still teach the young ones a thing or two. Having been in the executive previously and come under vicious and unjust attacks by this pair, I fully support them not being selected. They only serve to bring such a minor, struggling sport locally, into disrepute. The disrespect and contempt they show toward local players and officials is enough to ensure non selection. Well said. Mutual Maturity and Respect is an integral part of a teams ability to function at it’s best. Sad to say, but it definitely needs improvement. It has to be earned, not demanded. The selection criteria should not be subjective though. And so far three different legal bodies have found that the complaints from St Louis and Chung have merit. So I don’t think this whole thing boils down to just St Louis and Chung having rotten attitudes. To be honest, attitude has a great deal to do with TEAM sports. Granted, it is not a criteria, but it should have merit in as far as the functioning of a team is concerned. If an ‘elite athlete’ is not willing to meet, discuss and strategize with other team mates, what is the point? Table tennis is an individual sport played sometimes within a team setting. It’s different to football or hockey in that way. All the same, management should try to create a scenario that allows a transference of knowledge. It might be that tournament time isn’t best place for that though. Maybe it is at other times in year. Suppose he can still beat everyone at 75? Lol. If you can’t beat him at 50, why exactly are you going on the trip. Sightseeing perhaps.? Chloe Paul People bow out gracefully when they believe that they will soon not be able to beat the upcoming players and want to go out on top. Why exactly would he want to bow out gracefully when it looks like if these fellas will not be able to beat until him until he is 75 as Lasana says. An athlete fights to get on top and then fights to stay there. Anyone who doesn’t grasp that doesn’t understand elite sport. You don’t give up anything. They have to take it from you on the field of play. Lasana Liburd [Tell him to] Go in a senior competition. People don’t know when to bow out gracefully. Why doesn’t foreign based athletes share their knowledge and experience to help fellow athletes get better? How can a TEAM function efficiently, if members of the team hardly play together? Should CAC be just like the Commonwealth games?No practice, no communication, no coaching, no team spirit? What is going to motivate upcoming, talented athletes to even want to play the sport if these issues are not resolved? Shamin, I hope the TTTTA finds the answer for this. Clearly, relations with these foreign-based players are in urgent need of improvement. I am tired of this inane clash of Egos. Have proper dialogue and come to a conclusion that is acceptable to all parties involved. This has been the norm for years. It’s only recently these sporting organisations are being challenged legally, and quite rightly so. Once again- politics and probably Personal preference takes the stage over a proper selection process……. sad that now ALL of our sport governing seem to be plagued with corruption. Or exposing the younger sports men/Women with less money. This man is 50 pass his sell by date. Has he offered to defray some of the expenses or groom the younger ones. 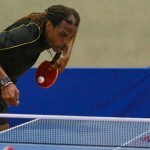 …it was flawed because TT’s best table tennis player (by a very wide margin) was not selected. What criteria is used to determine he is ‘the best’ when he has not competed in a local tournament in the last year. Meanwhile, other local athletes have improved in their performance from a year ago. Stats for achievements years ago, is no longer a deciding factor. All players must continually prove their worthiness to compete. That’s why trials are held. I agree. And it is the TTTTA’s responsibility to put that trials together in a fair manner. I was there in 2016 when St Louis and Chung won the T&T national championship. I look forward to seeing the young guns take another crack at them as soon as possible. From the information posted in the news and media, it seems that the TTTTA has continued to affirm that the foreign based players were informed fairly and timely. Also In 2016, you may have recalled that his win was not by a big margin, As a ‘decorated’ player, one would have expected younger players to be inspired by his performance. I am not sure if that was the case. I have no special interest in table tennis but I feel duty-bound to comment on one aspect of the current issue. Assuming that Wired868 has faithfully and accurately reproduced the TTTTA’s media release, if that is the best the Association can do, then I feel pretty certain that they have little to no chance of success if they represent themselves—as, alas, they have opted to do.